There is a well-known mantra in the world of exercise: ‘Get fit to play sport, don’t play sport to get fit’. Many participants in sport sustain injuries because they start a new sport without an underlying level of fitness, or increase the intensity or duration of their training too quickly. Injury prevention in sport is very much about ensuring that your body is conditioned to a level which allows you to take part without sustaining injury, whether it be athletics, football, golf, tennis, boxing, etc. So, if you haven’t exercised for a while and you’re thinking of playing 5-aside, it makes sense to begin a physical training programme before you even kick a ball to ensure your muscles and joints can cope with the demands of the sport. The type of conditioning exercise that can be of benefit before embarking upon a new sport, or returning to sport varies depending upon the demands of that sport. Returning to a sport which involves a lot of running requires good hip, knee and ankle control so leg strengthening and stability programmes are important. Returning to sports that involve using the arms, such as boxing and racquet sports, require a mixture of leg, core and arm strengthening work to ensure that you can move lightly and fluently on your feet as well as being able to generate enough force through your trunk and upper body. Despite good conditioning, injury can still occur especially if you train too frequently or too intensely for what your body can tolerate. The repetitive nature of some movements in sport can take their toll over prolonged periods. Injury can occur gradually over time by loading the same tissue repetitively, or through a sudden change in activity such as hitting a golf ball repetitively at a driving range for an hour when you’ve not played for a while. Whatever the sport, or your level of fitness, the most important thing is to gradually increase load, speed, time or distance to minimise the risk of injury. If an injury does occur, then it is important to stop doing the activity immediately. Common over-use sporting injuries include; ankle sprains, groin pulls, hamstring strains, anterior knee pain, shin splints and tennis elbow. Most mild sprains and strains can be managed through a short period of rest and using the principles of RICE (rest, ice, compression and elevation). If symptoms persist then it is advisable to book an appointment with a suitably qualified medical professional such as a Physiotherapist or GP for a formal diagnosis, advice and treatment. More serious injuries such as fractures or full ruptures of muscles, tendons or ligaments need to be reviewed immediately at A&E. Overuse injuries affecting the front of the knee include patella tendonitis and patellofemoral pain syndrome. The first is caused by repetitive loading of the patella (quadriceps) tendon and the second by the repetitive movement of the kneecap (patella) against the thigh bone (femur), especially when knee alignment is poor. High impact activities such as running, skipping and aerobics are most likely to result in these overuse injuries. 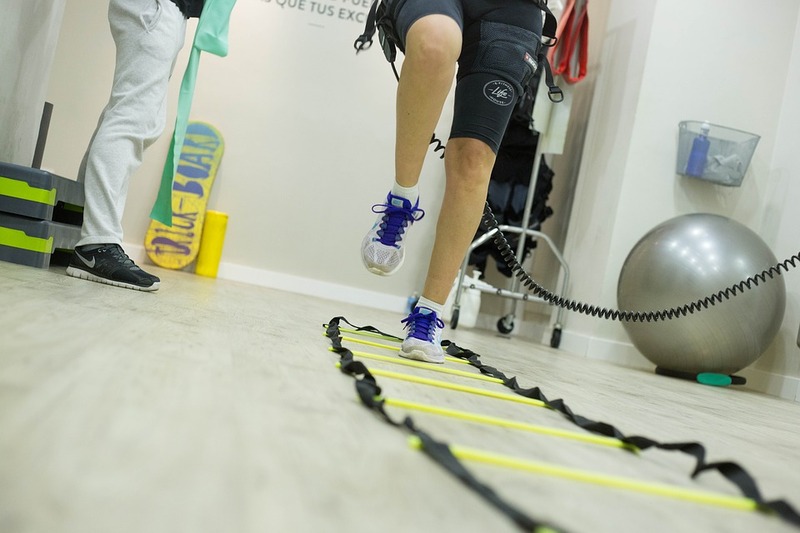 For some a period of rest is sufficient to settle the condition, but for others, addressing the biomechanical issues through a structured rehabilitation programme is necessary to enable recovery and prevent recurrence. Shin splints is an overuse injury often caused by repetitive activities such as running. This is when lower leg pain occurs below the knee either on the front outside part of the leg (anterior shin splints) or the inside of the leg (medial shin splints). Anyone new to running who doesn’t gradually build their mileage is particularly susceptible to this type of injury as well as seasoned runners who abruptly change their workout regimen, adding too much mileage or switching from running on flat surfaces to hills. When shin splints strike, it’s recommended to stop running completely or decrease training intensity depending on the extent or duration of pain and to seek medical advice if symptoms persist. Tennis elbow is also a common overuse injury in sports, affecting those who do repetitive movements of the wrist or grip for long periods, such as playing racquet sports or weightlifting. This condition affects the tendons on the outside of the elbow and will usually heal with physiotherapy treatment and activity modification. It affects up to 3% of the population, but less than 5% of cases are linked to tennis. Repetitive use of the tendon leads to small tears and inflammation within the tendon, which if left untreated can become chronic and the tendon starts to break-down. Rest from the provoking activity and a course of Physiotherapy helps to alleviate pain and strengthen the tendons ready for a gradual return to sport. In addition to good conditioning and gradually increasing exercise levels, warming-up prior to exercise is essential as this increases blood flow to the muscles, and increases overall soft tissue flexibility and elasticity. Cooling down after exercise is equally as important as it helps slow the circulation gradually so preventing pooling of blood and helps the body remove the chemical by-products of exercise such as lactic acid. By making the time to warm-up and cool-down properly you also reduce the risk of injury. In summary, it always pays to be sensible when embarking upon a new exercise programme or returning to sport. Preparing the body for exercise through good conditioning and gradually increasing the demands on the body will significantly reduce the risk of injury and so enable you to continue with the sport that you enjoy. Don’t be tempted to do too much too soon, or you run the risk of not being able to do that sport at all!